Protest carried out by healthcare professionals working at state-subsidized private centres ACN. Catalonia’s healthcare union Metges de Catalunya has called a strike for healthcare professionals working at state-subsidized private centres for February 18 to 22, which will affect more than 10,000 professionals from 53 acute care hospitals, 86 primary care teams, 50 social health centers and 25 mental health centers.The union is calling this strike a mere two months after the last one. Union sources state that neither employers nor the health service have shown any “willingness to negotiate” about care, labour and compensation improvements and that professionals’ discomfort is being “belittled”. 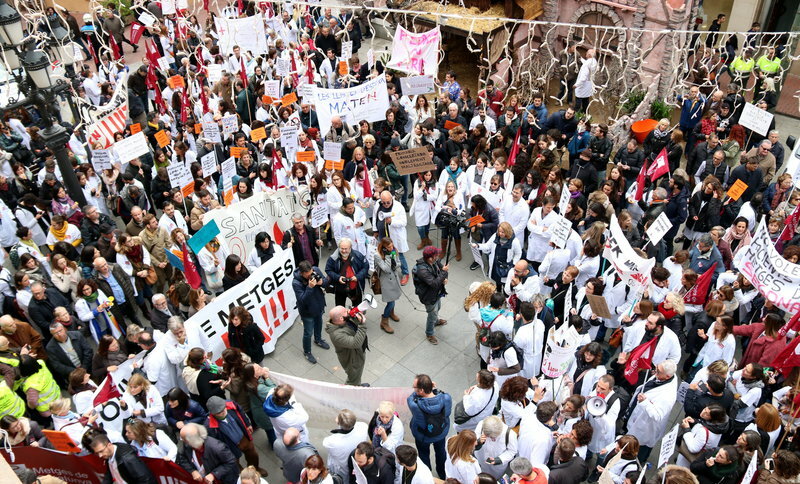 Yesterday Metges de Catalunya criticized Adrià Comella, director of CatSalut, who has failed to keep his word and handle the conflict with state-subsidized private health operators once a pact was made with Catalan Health Institute (ICS) primary care doctors. We are doctors, we are the health system and we want quality, is to be the slogan of the mobilizations in February, in which the demands from November will be restated, including measures to reduce workloads and improve the quality of care and working conditions (professionally and in terms of labour and compensation) at both primary health care centres and at state-subsidized private centres.